Vacation rental house. 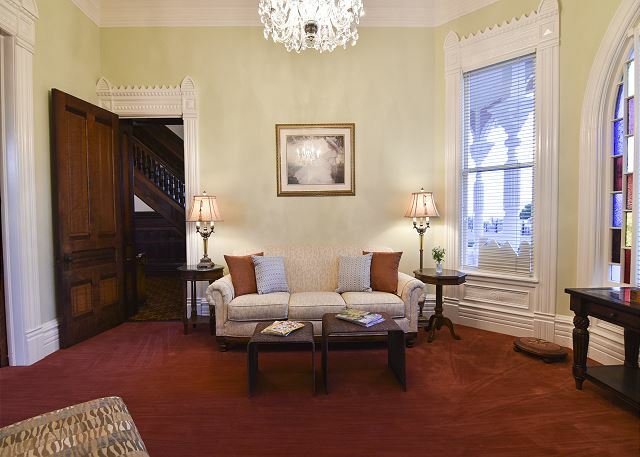 Sleeps 10, 4 bedrooms, 2.75 bathrooms. No pets allowed. View of the front parlour. 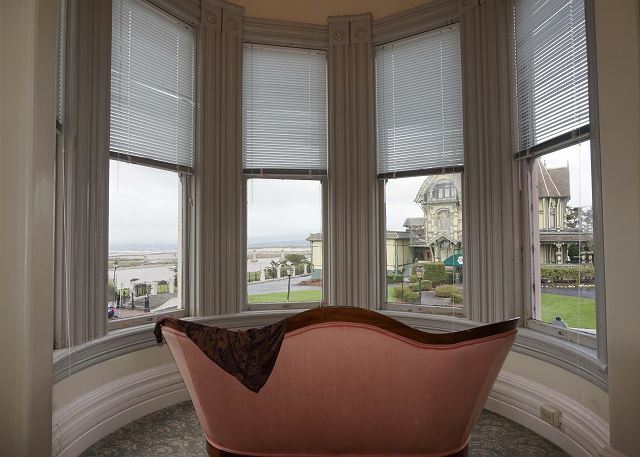 Stunning view of Humboldt Bay and the Carson Mansion. Kichen with new appliances and amenities. Upstairs hallway to bedrooms and bathrooms. Perfect Event Space, large completely fence side/backyard. View of the private yard. Sun Room, overlooking the expansive yard. 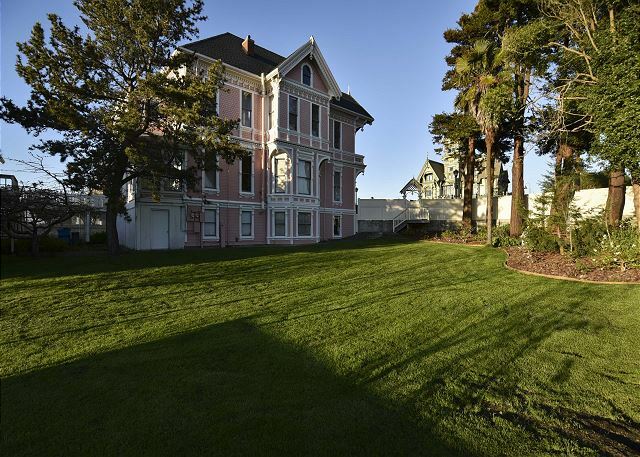 The Pink Lady – a Classic Victorian Mansion. 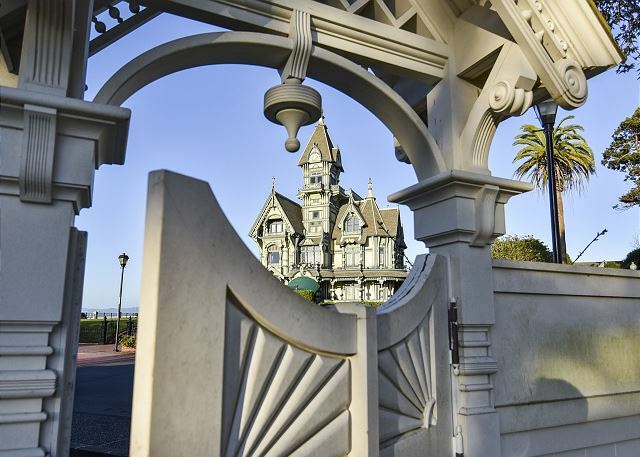 Originally built by William Carson, the infamous lumber baron who erected the world famous Carson Mansion across the street. The Pink Lady was a wedding gift for his son Milton Carson. 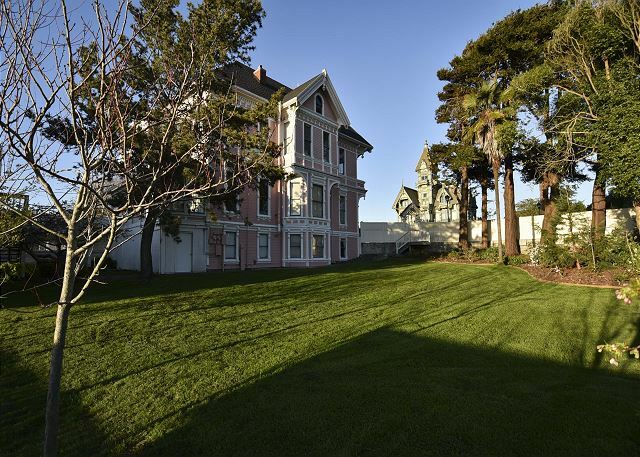 This late 1800s hundreds Queen Anne/Eastlake Victorian Mansion is perched right along the Humboldt Bay offer gorgeous views of the Carson Mansion and the Eureka Harbor. 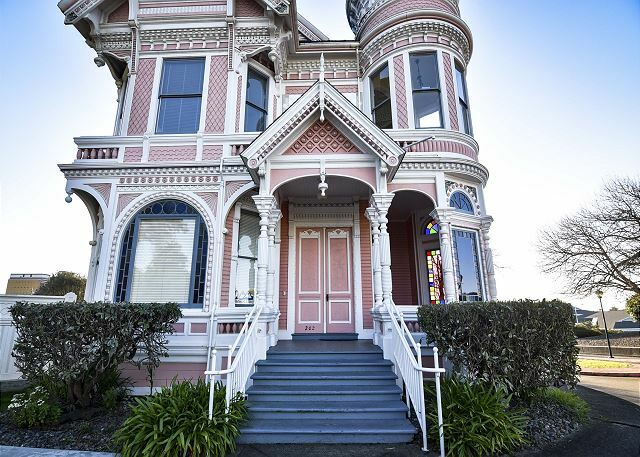 This ornate Victorian era home was designed by the Newsom brothers, the same respected architects that constructed the iconic Carson Mansion which is the most well-known and photographed Victorian house in the United States and is located directly across from the Pink Lady. 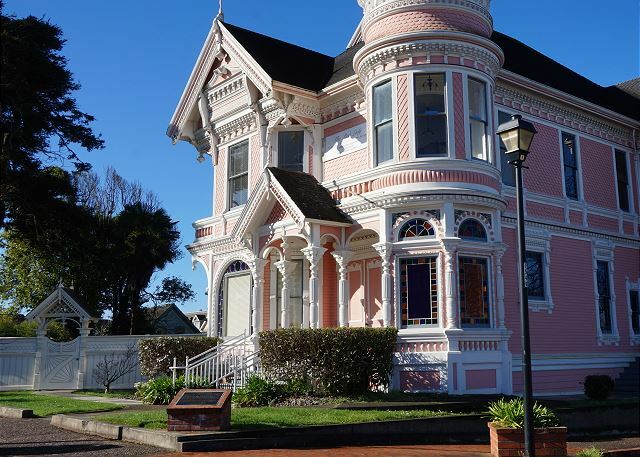 Situated in Old Town Eureka on the Humboldt Bay, the Pink Lady offers all the comforts and amenities of an accommodating mansion. It features 4 bedrooms (see below), 2 Full Bathrooms & 2 half baths, a modern Kitchen with all the necessary amenities & essentials, formal dining room, two gorgeous and spacious parlors for entertaining guests, a breakfast nook, sun room, high-speed wireless internet, cable TV, period specific antique furniture throughout, and a very relaxed and inviting atmosphere. 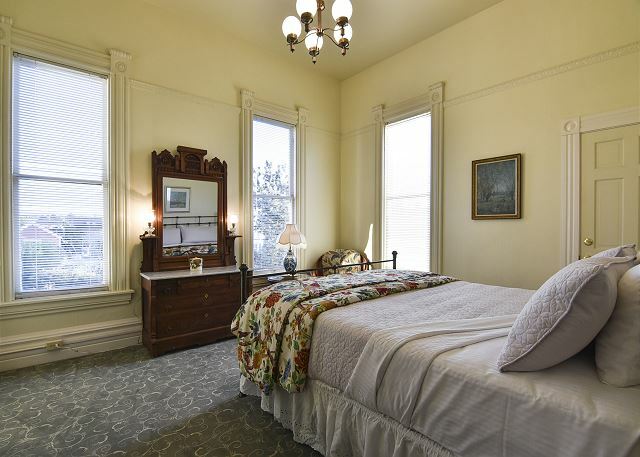 Bedroom 1 features a King Bed and sitting area in the Turret with offering gorgeous views of the Carson Mansion and the bay. 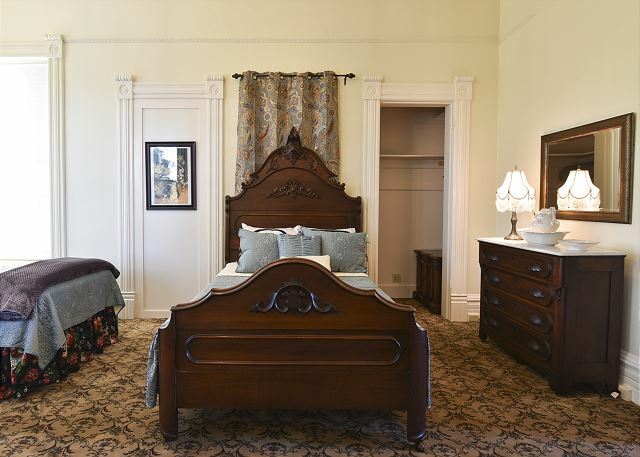 Bedroom 2 is an east facing room with a beautiful queen canopy bed and ample closet space. 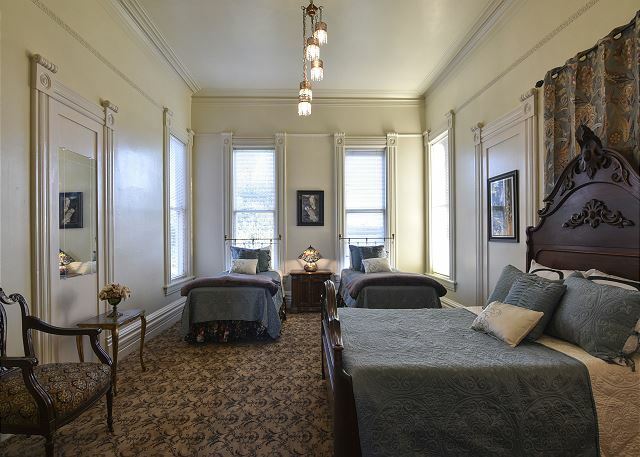 Bedroom 3 offers sleeping for 4 with gorgeous antique full size bed and two twin beds. Bedroom 4 is a west facing room gorgeous sunsets, sitting area, and a king bed. 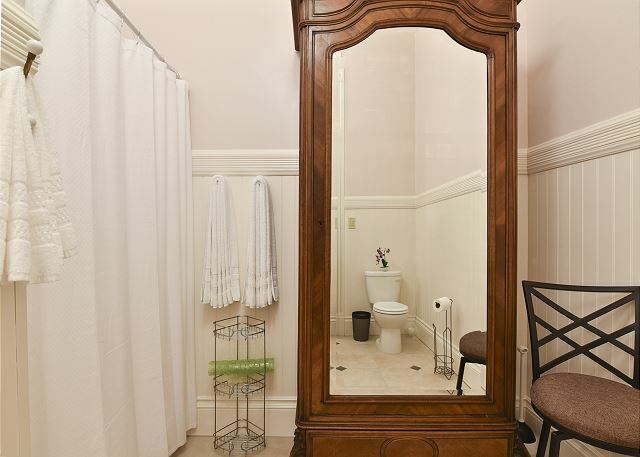 There are 2 & ½ bathrooms upstairs. 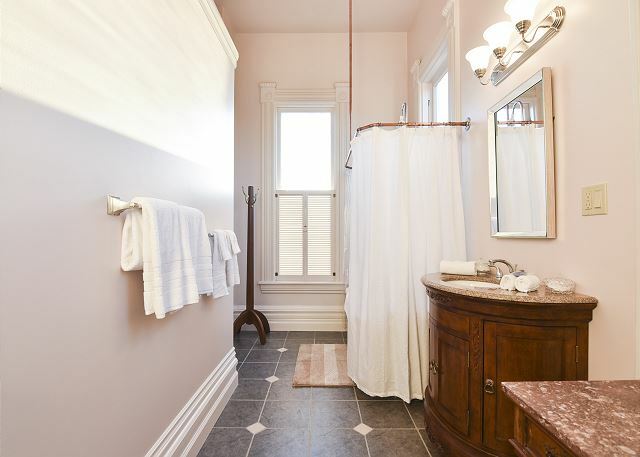 Each of the full baths are very spacious, one features a standing shower, and the other features a claw foot shower/tub combo for a relaxing soak. 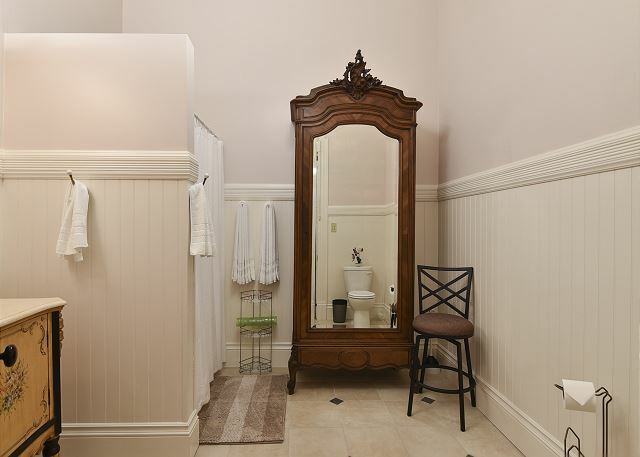 There also a ½ bath downstairs for convenience. Please note: In order to accommodate a broad audience at this accommodation, the nightly rate listed is for 4 guests. If your party, including children, has more than this number, please select that when booking or notify the booking agent as the nightly rate increases by $15 per guest. Thank you so much for noting this. 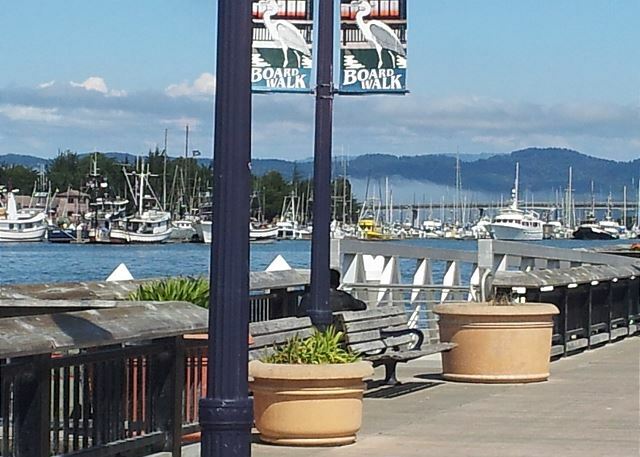 We look forward to accommodating you on the Redwood Coast. There Pink Lady is available as a venue for weddings and private events. The back garden features a very large yard, with ample seating and dance floor space. The two main parlors offer enough space to seat 50 for a private dinner. For more information, email us or call for a brochure. 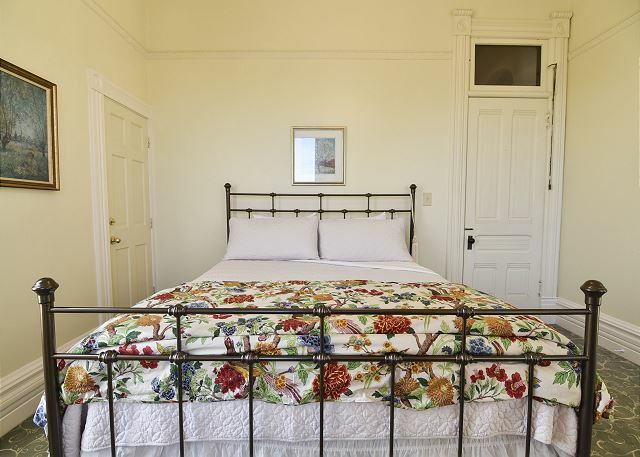 Stay at the Pink Lay and experience all the Redwood Coast has to offer! 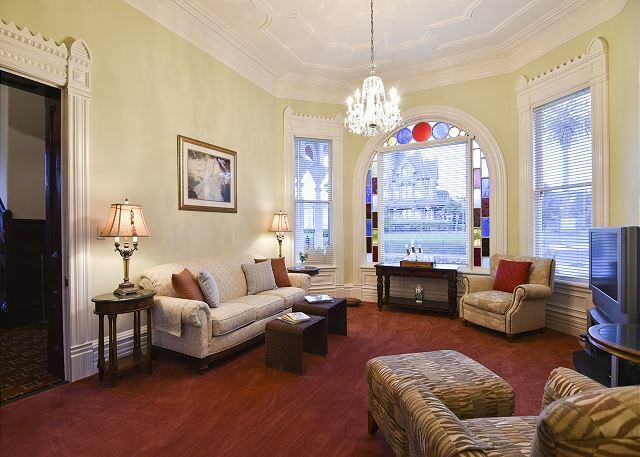 This Old Town Eureka Mansion is a perfect home base for a Redwood Coast adventure. Centrally located in Eureka, 40 miles south of Redwood National Park, and 40 miles north Humboldt Redwoods State Park with breathtaking coastline throughout. 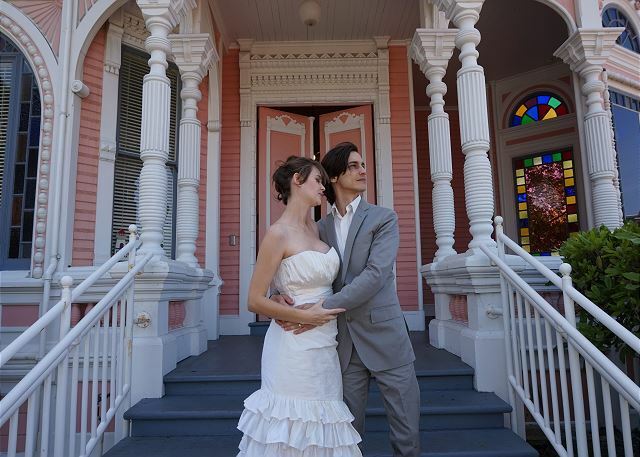 we chose this location for our very intimate wedding because of its proximity to downtown, there was space enough for several family members to stay there all weekend, the stunning views and obviously between it and the carson mansion across the street we took countless wonderful pictures. because we were having a wedding at the house and only gave ourselves one day to set up we were left with a bunch of questions. Jesse, the property manager got back to us with answers/solutions to all of our concerns promptly. Would love to rent again. Thank you Bryan for leaving a review of your stay at The Pink Lady. We really appreciate all your valuable input and feedback, and were very happy we could accommodate you and your group for such an important event! Thank you for staying with us and I'd love to have your family and friends back again. Please look us up at Redwood Coast Vacation Rentals when looking for the perfect vacation rental for either yourself or others, with over 140+ properties from Del Norte county down to Fortuna, there is something for everyone at RCVR. Thanks again. It was like waking up in a beautiful museum each morning. We can't wait to come back. We are thrilled we can offer The Pink Lady as an accommodation to our guests, it's really a special place and a great property. Thank you for leaving a review of The Pink Lady, and I hope you can return to stay with us again soon! Please look us up at Redwood Coast Vacation Rentals when planning your next stay on the North Coast! First, "Thank You" to the owner of this incredible home. 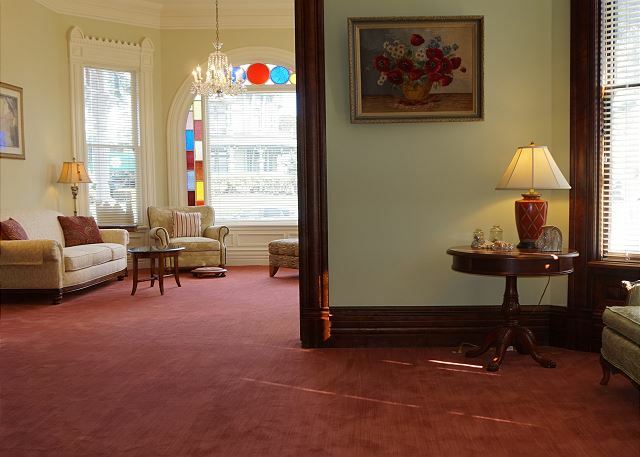 This house has all the original woodwork and glass as well as authentic period furnishings and lighting. 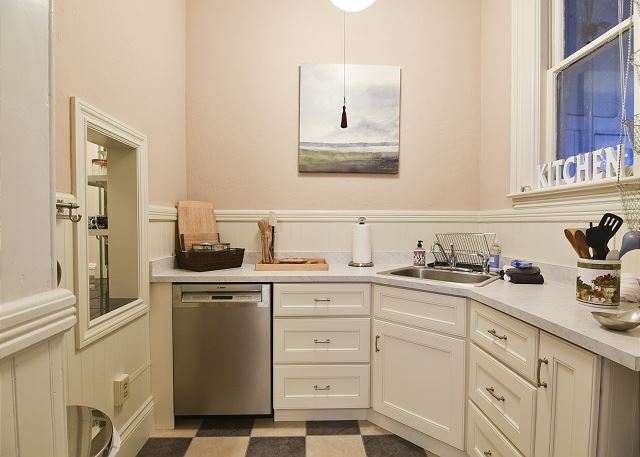 The bathrooms and kitchen have been seamlessly incorporated into the rest of the home. It is spacious and comfortable and absolutely beautiful. If you are an enthusiast when it comes to authentic architecture, this is a "can't miss" opportunity. Every time I looked around the space I was reminded of how truly unique this home is and am grateful to have had the opportunity to stay there. The view from the bedrooms is wonderful. This is perfect for a family vacation or a weekend with the girls. Located close to everything you need and within walking distance to local dining and shopping venues. Tour The Blue Ox woodworking factory or The Lost Coast brewery while you're there. Not for the physically challenged as all bedrooms and bathrooms are upstairs. Bonus: the huge claw foot tub...wonderful after a long day of sight seeing. Can't wait for my next visit. Thank you so much for your through review, and I'm so happy you enjoyed your stay at The Pink Lady! We would love to have you back , so please look us up at Redwood Coast Vacation Rentals when planning your next trip to the North Coast, and thanks again for your review Colleen! Worth the pretty penny for the marvelous experience. Thank you for taking the time to leave a review of The Pink Lady. 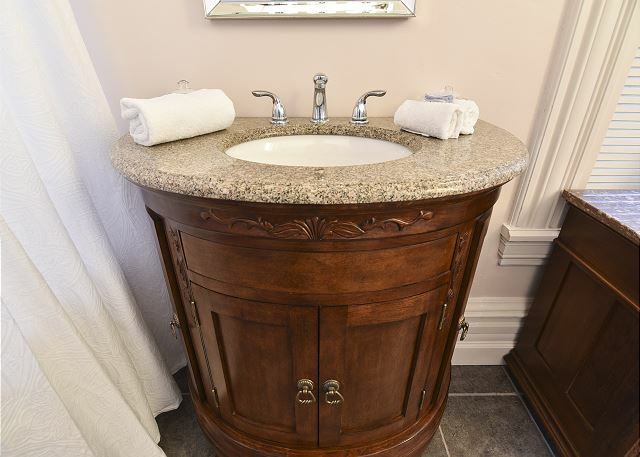 We are really fortunate to have this gem in our inventory of beautiful homes. We would love to have you back again, please look us up at Redwood Coast Vacation Rentals when planning your next trip to the North Coast! We found the house to be a perfect base for us as we checked out NoCal. Lots to do and see within an hours drive. My kids loved the house and enjoyed finding books at a local book store with the house in it. The house had everything we needed to make our family feel at home! Wonderful, happy to hear you enjoyed your time there! 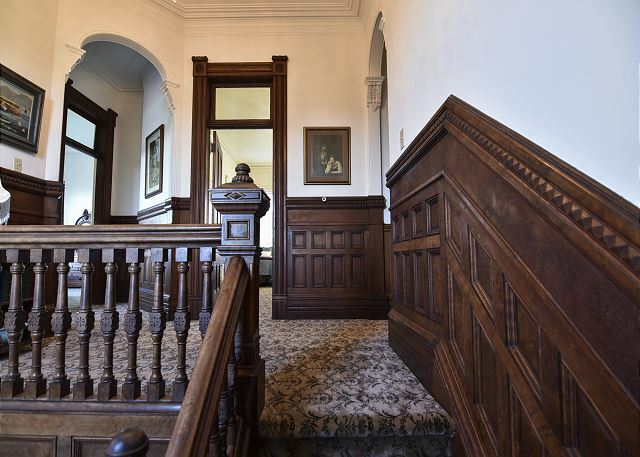 What a blessing that we can offer such a grand old home and a piece of local history to our guests! Please come back and visit anytime, we look forward to your return! Look us up at Redwood Coast Vacation Rentals when planning your next trip to the North Coast! The Pink Lady was spectacular. Beautiful historic landmark! Staying there was a special and unique experience. So happy to hear this! We look forward to your return to this gorgeous home, and please look us up at Redwood Coast Vacation Rentals when planning your next trip! Fabulous Place. Areal step back in time. 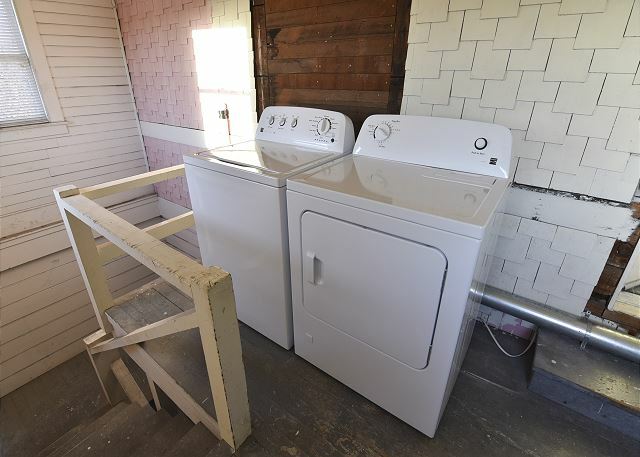 Having a washer/dryer was a real plus. The only disappointment I had was that we were unable to get into the back yd. Hi Mary, thanks for leaving a review of The Pink Lady. I'm perplexed as to why you were unable to reach the back yard? I would have been happy to come over and show you the way if I had known you were unable to figure it out. That's what we're here for! Please do not hesitate to call the property manager for help, I'm very sorry to hear you were unable to play croquet on the vast lawn out back. Please come back and visit soon, and I'll be sure to show you how to reach the outdoors. Thanks so much for the review, we really appreciate your feedback! We rented this home because we needed a place to sleep 10 relatives for my son's wedding at Fieldbrook Winery. 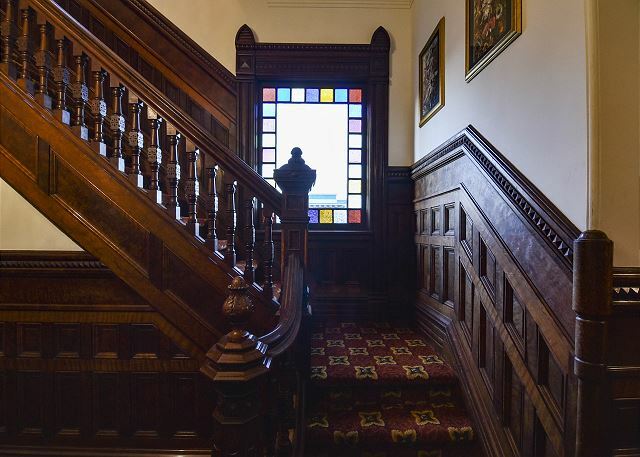 The house is very spacious and has a lot of nice, Victorian touches, like stained glass windows and dark wood on the stairs, doors, and trim. The bedroom furniture is lovely, but does not sacrifice comfort. The master bedroom has a nice sitting area with a view of the bay. 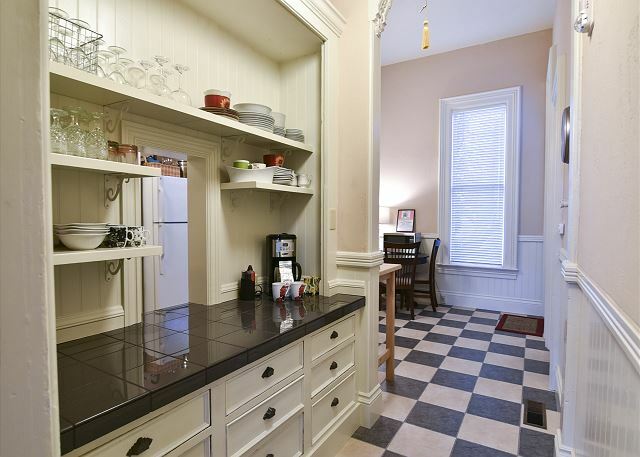 The kitchen is small because it is the original, but it has a work island on one wall and a round dining room table for four. 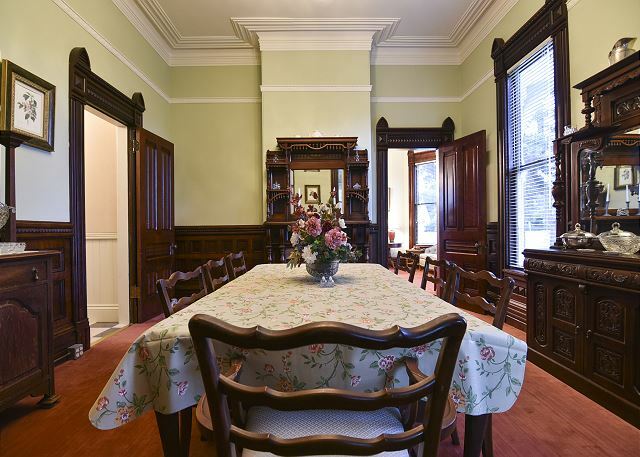 There is a formal dining room that sits 8-10 people, and a sunroom. 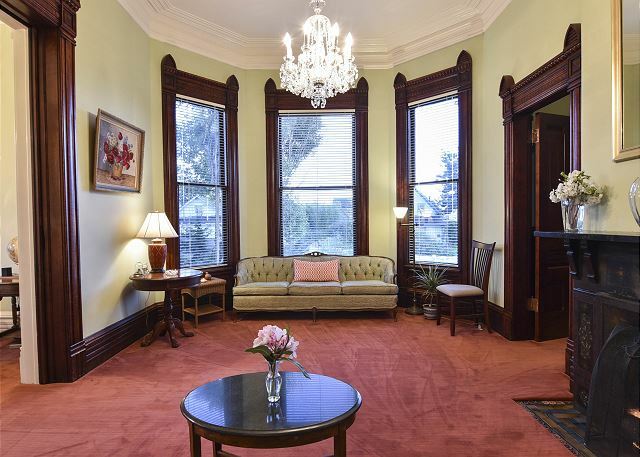 The front parlor has a view of the Carson Mansion, which is across the street and the ocean is a few blocks from the house and the downtown area. All-in-all, it was a fabulous place to stay and our family members felt very comfortable. If someone is traveling with small children, they would want to know that the only downstairs bathroom is outside the kitchen and that an adult would have to take children down the stairs outside the kitchen door to get to the yard. An adult cannot see the children in the backyard from inside. But, if the house is rented for adults and teens, the house is a good value for the rental price because of all the space and the quaintness of the home. Thank you for your thorough review of The Pink Lady! Yes, it would always be recommended that an adult be with very small children when heading downstairs, even though there is an automatic light that turns on via sensor. There are plenty of Adirondack style chairs for folk to sit on and relax while watching a game of croquet. Thanks again for your review, feedback is always appreciated and we look forward to having you back soon to The Pink Lady! Great place for a family gathering. 10 of us stayed for a wedding nearby. Fun to imagine living there long ago. 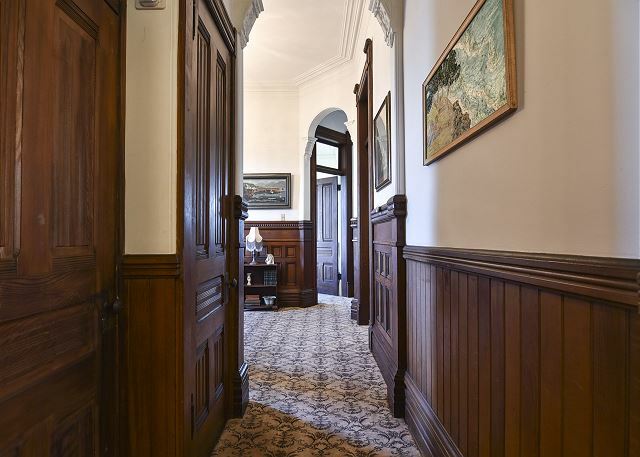 With views of the Carson Mansion across the street and within walking distance of historic downtown. Glad to hear you appreciated the beautiful Pink Lady! 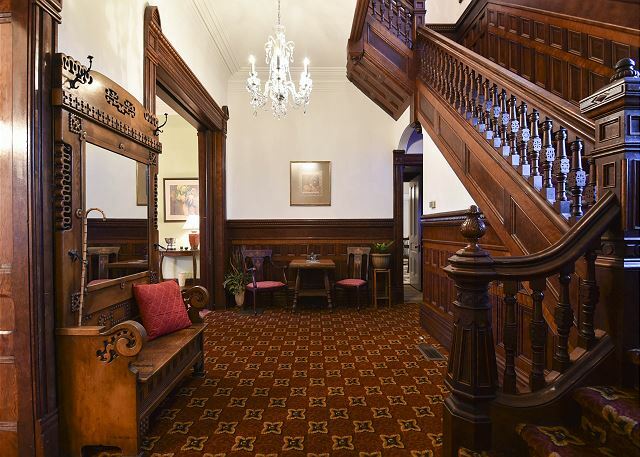 What an absolute gem, and we are so happy we can offer this property to our guests. 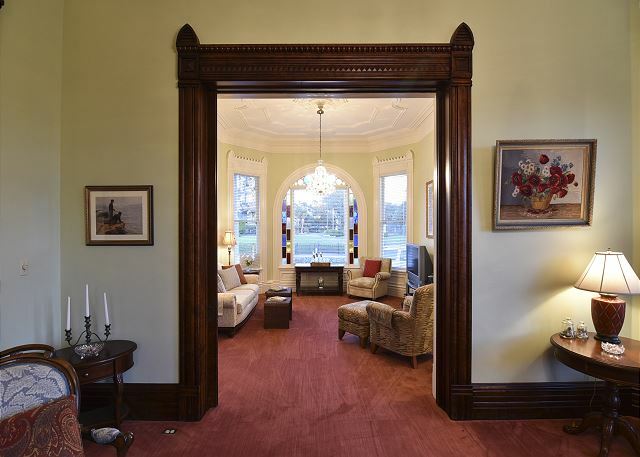 It's like stepping back into history, as the home was built by William Carson as a wedding present for his son John Carson in 1889. We would love to have you back again, please look us up at Redwood Coast Vacation Rentals when planning your next trip to the North Coast! Thank you! We are so glad you could accommodate you at the Pink Lady. 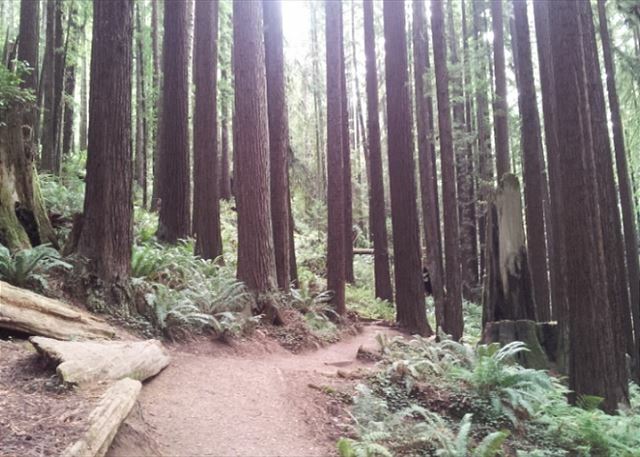 It is really such a great place for visit to the Redwood Coast or for an event. We look forward to your return. The "Pink Lady" was a hit! 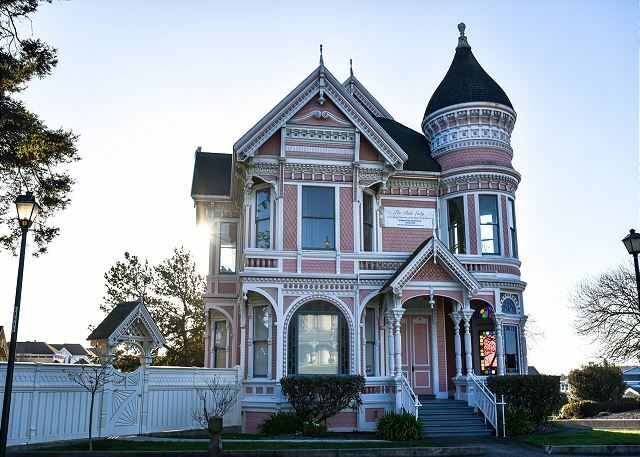 The Pink Lady is a turn-of-the-century Victorian home located in Eureka, CA. It has 4 bedrooms and 2 1/2 bathrooms upstairs and a large living room and kitchen on the main floor. Large back yard and perfect for a large family vs. multi-hotel rooms. Happy to hear you enjoyed your stay the The Pink Lady. This home is a true gem and we are so happy we can offer it to our guests as a vacation destination. It's a true piece of North Coast history, with an owner who takes pride in maintaining the home. Thanks for your review, we look forward to having you back soon to The Pink Lady. Please look us up at Redwood Coast Vacation Rentals when planning your next trip to the North Coast! The Pink Lady provided a wonderful place for our family to gather. 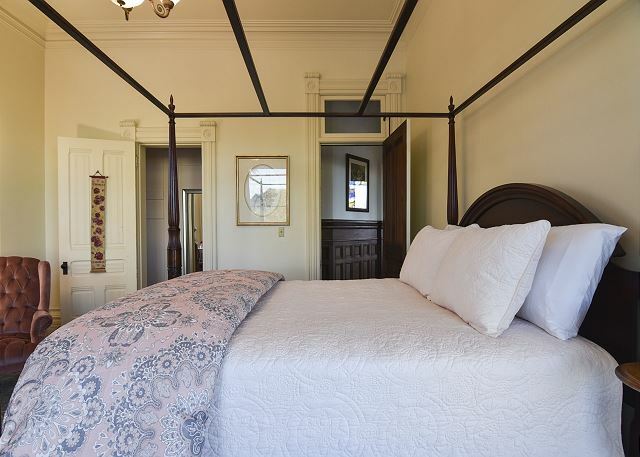 The beds were very comfortable, the bathrooms well stocked, big backyard and the entire house was clean and inviting. We enjoyed our stay and if the opportunity arose, we wouldn't hesitate to rent the Pink Lady again. PS Jesse was very attentive to our questions -good customer service. Thank you for the wonderful feedback, we feel very lucky to include The Pink Lady among our many properties, the home is in terrific shape for being an historic building and a local treasure. We hope you return soon and please look us up at Redwood Coast Vacation Rentals when planning your next trip to the North Coast! What a great place to stay while visiting Humboldt Co. 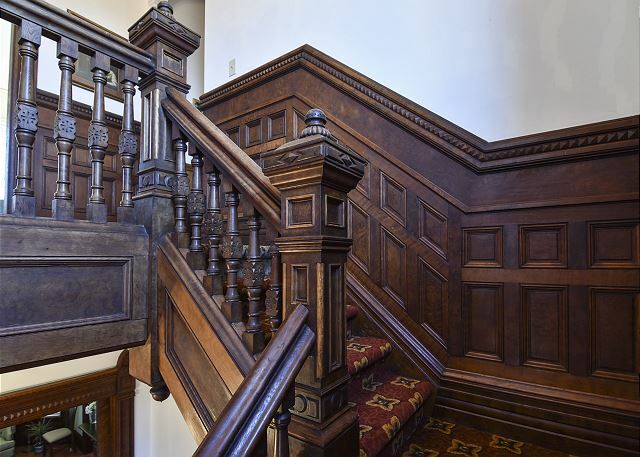 The entry foyer takes your breath away with the dramatic staircase and paneled walls. 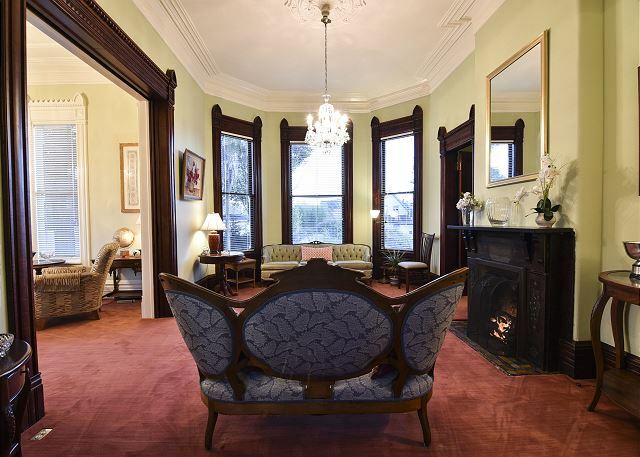 The best spot is the living room where you can look out at the spectacular Carson Mansion. We highly recommend the Pink Lady! The Pink Lady is a treasure that we feel grateful to be able to offer to our guests as an outstanding accommodation. There are very few majestic homes like her, thank you for staying with us and leaving a review, please come again soon! We had a very pleasant and enjoyable experience at the Pink Lady. Modern technology gave us easy access to the property and the home is beautifully maintained. The management company gave us a courtesy call to make sure we had everything needed before we arrived. Would love to stay here again in the future. And we would love to have you back, so please don't hesitate to look us up at Redwood Coast Vacation Rentals the next time your headed to the North Coast! So happy you enjoyed your time at The Pink Lady. Excellent rental experience. When our few days in Eureka turned to rain, it was a pleasure to be rained-in. There were 7 of us and there could have been a few more. Everything was lovely. Clean and lovely, but not too stuffy. Comfortable. So happy to hear the rain didn't put a damper on your vacation, and that the Pink Lady was enjoyed by all! It truly is an honor to represent such a grand home, it's truly a gem! We are so happy that we are able to allow others to enjoy such a unique and historic home. The decorator spent a lot of time choosing the furniture, so that it complimented the home, yet wasn't too "stuffy" and guests would be able to enjoy. We hope to have you back soon to this beautiful home, so please look us up at Redwood Coast Vacation Rentals when your planning your next trip to the North Coast! Had a Great Time in a beautiful house! So Glad to hear you loved the Pink Lady! 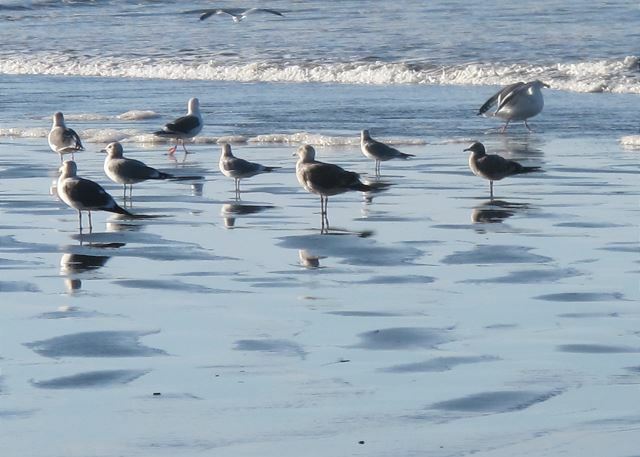 We look forward to your return to Redwood Coast Vacation Rentals, a 100+ accommodation company! We rented the Pink Lady for family coming to Eureka for a wedding. The house far exceeded our expectations. It's beautiful inside and out. 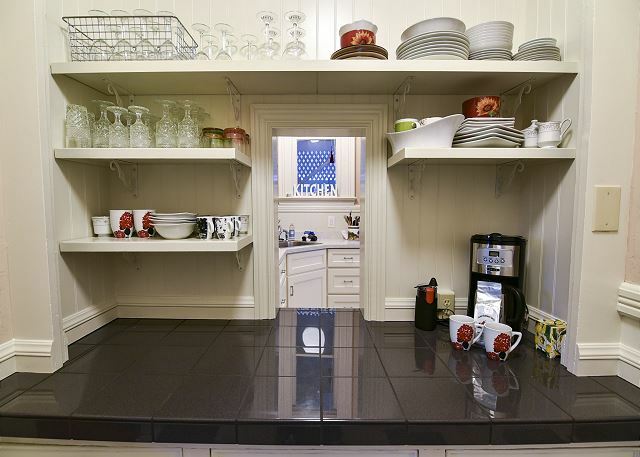 It's beautifully furnished, has very comfortable beds, and the kitchen was great. And the location can't be beat! Check in and check out are easy! I highly recommend the Pink Lady. Thank you Julie for leaving a review! We couldn't be happier that all your expectations were met, and even exceeded. 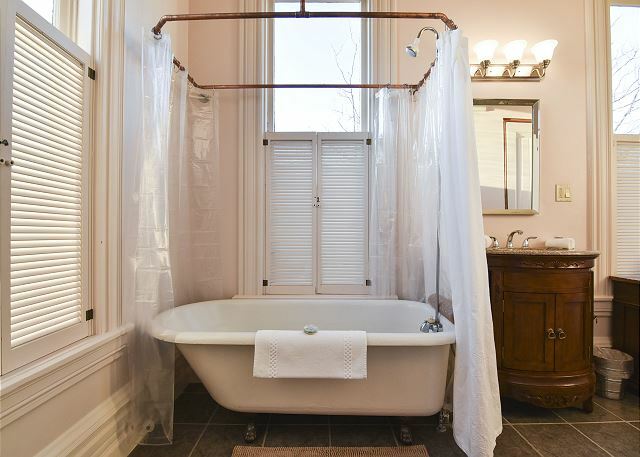 The Pink Lady is such a beautiful, historic home and a lot of care and time was put into picking just the right furnishings, so that she can shine once more. We're always happy to hear that the process of checking in and out went smoothly, our property managers are always a phone call away if needed. We look forward to seeing you again the next time you find yourself planning a trip to the North Coast! Please visit our website to see the other properties we proudly represent, at 100+ properties, there is something for everyone. Thanks again Julie! Our daughter and son and their respective spouses and children gave us a trip for our 40th anniversary which was last July. After deliberations CA was chosen and our two goals were wine country and the Redwood National Forest...especially since one grandson is named Forrest. Our daughter actually did the search and we settled on the Pink Lady for our rendezvous point in Eureka to be close enough to wander the redwoods easily in day trips. 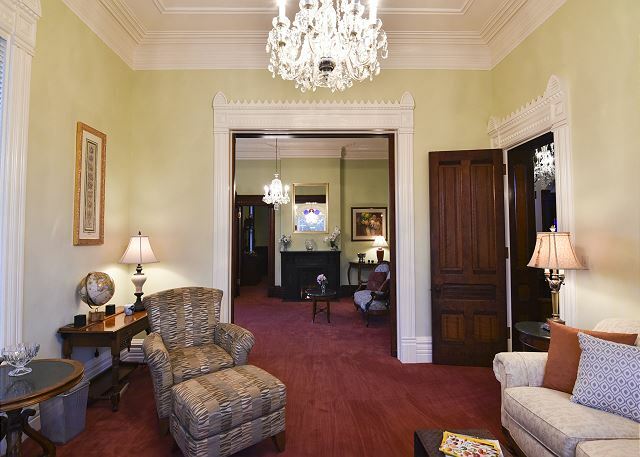 The house is magnificent, the town enjoyably quaint even for people from small-town VA. I personally, having never been to CA before, learned a lot from the experience and especially enjoyed seeing things I'd either only read about or watched on TV. To say we enjoyed the trip doesn't do the experience justice. Thank you so much! The Pink Lady is loved by all who stay there. It a victorian Icon of Eureka, highly photographed, and very sought after. We are so pleased to hear you enjoyed your time at the Pink Lady! Thank you for this Great review. Great as always, the ladies and I had a fabulous time. You cannot beat the Pink Lady for comfort, beauty, and location. However, last time we stayed, we requested something to sit on in the backyard. That had not been accomodated. It's a huge, gorgeous grassy yard, and it was sunny for us, and nowhere to sit except in the grass itself. Seems like the owner could provide some chairs at least so guests can enjoy the beautiful space. Thanks you! We appreciate you coming back to the Pink Lady, always nice to have you. Yes, We agree, we shall get some seating for the beautiful Back Yard!! See you next time. Wonderful House! Great for multiple guests or a romantic getaway. My husband and I are locals to the area, but have always wanted to stay in this home. We contemplated the purchase when it came up for sale, but didn't jump on it. It was great to be able to stay and pretend, just for an extended weekend. The house is incredibly warm and inviting, very comfortable for an extended stay. The rooms were very well appointed. As always a little gift of locally crafted treats awaited us (Redwood Rentals does an amazing job of this). The weather was not the most cooperative, but being able to look out each morning on the Carson Mansion and the bay was a real treat. We also took the opportunity to dine and have a tour of the Carson Mansion across the street, which was a wonderful addition to our Valentine's getaway. The only caveat is that you have to be prepared for people to stop out front and take a lot of pictures. And I mean a lot...on average a car pulls up every 5 - 10 minutes throughout the day. It makes for some fun photobombs! Thank you so much for coming to stay with us at Pink Lady. It was very nice having you as our guest. 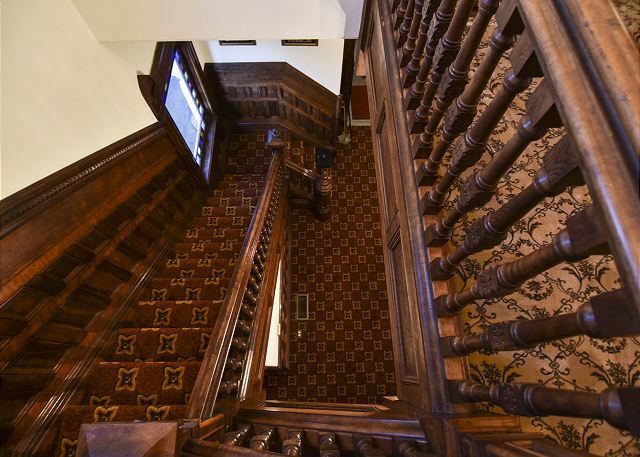 We are so pleased you enjoyed the home and dinner at the Carson Mansion. We hope your Valentines Day was everything you wanted it to be! We look forward to your return. Wonderful return trip to Eureka with family though the first time (and not the last time) at the Pink Lady!! Jesse, thank you for all of your help and with your arrangements for my husband's surprise 60th birthday tour and dinner at the Ignomar Club (don't miss this wonderful experience)!! 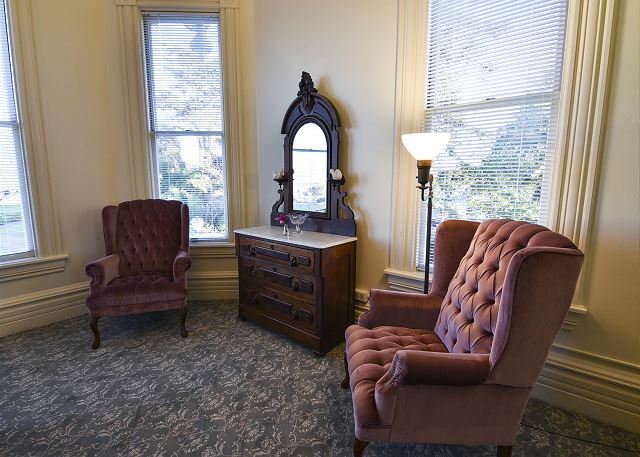 The Pink Lady is outfitted beautifully with period furniture, wonderful spaces with great stained glass windows and very comfortable accommodations at a price that equals the cost two regular hotel rooms. The website pictures accurately represent the property but can't give you its full scope. 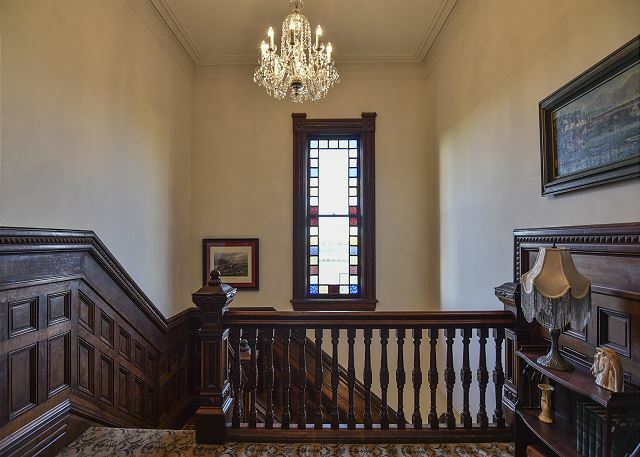 As an owner of a restored 1850's home, this home has been restored beautifully with the stained glass, original window glass, plaster ceiling medallions and wonderful woodwork (as you might expect from a lumber baron). 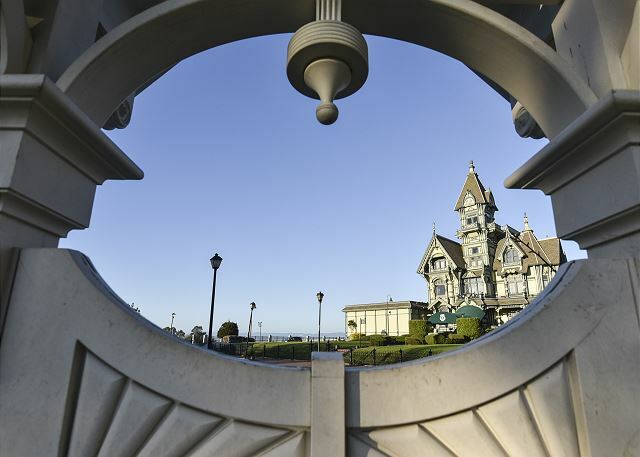 I already miss my evening routine of enjoying a glass of wine in the round master bedroom alcove overlooking the bay and the Carson Mansion after the rest of the family has gone to sleep. Great area attractions to include the city park with their great trees if you can't make it down to the Avenue of the Giants!! Great local restaurants and galleries. Great restoration and thank you for sharing this property!! Thank you so much for taking the time to write this review and for recognizing what an amazing experience the Pink Lady had to offer. It was so nice to meet you and to have you as our guest! 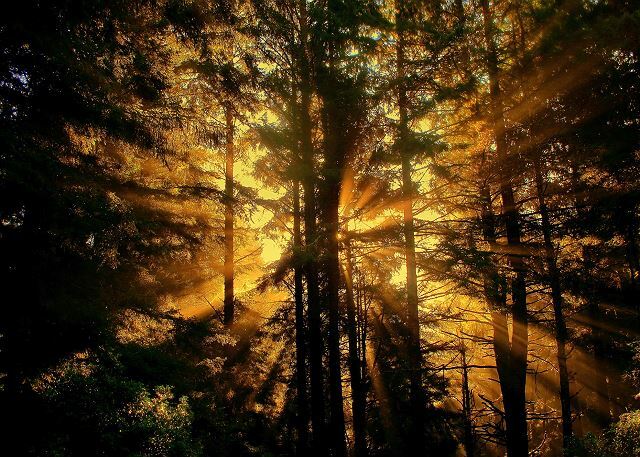 We look forward to your return to the Redwood Coast! This place is very good. Home is very clean and every thing is available. We had a great time in the the home. Thank you so much for staying with us in the Historic Pink Lady. Thank you as well for taking the time to write a very nice review. We look forward to your next visit to our beautiful area! My friends and I stayed at the Pink Lady for my birthday, two nights in Old Town Eureka. So much fun, and tons to do. We walked everywhere, from morning coffee and bagels, to upscale dinners, to bars and pool at night. The house itself easily accommodated everyone; plenty of bathrooms and privacy, and the bedrooms were completely quiet. Comfy beds and lots of fun, quirky spaces to hang out. One idea: the home needs backyard seating options. We sat on beach towels we had brought. A table and chairs for drinking wine in the lovely backyard would be great. Thank you, we're so pleased to hear you loved the Pink Lady. 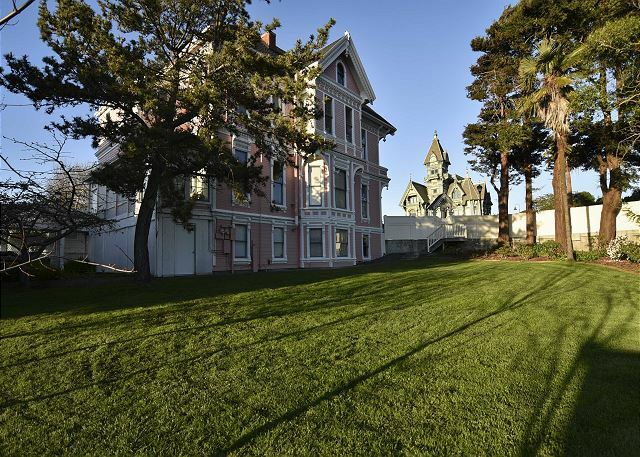 This accommodation is truly a dream come true for many visitors on the Redwood Coast by offer an opportunity to stay in one of the most famous Queen Ann Victorians in the county! We look forward to your return. Back Yard seating options are a great suggestion, thank you! Great old house and very clean. Enjoyed walking to old town and simply lounging in the house. Every one just loves the Pink Lady! Thank you for staying, it was so nice having you as our guest. We look forward to your return! The house was fantastic - period details throughout and a great location! Thank you! It was so nice having you as our guest at the Pink Lady. We look forward to your return! My family and I had the pleasure of staying at the Pink Lady. The place is well equipped (even more than described), the house is maintained well and the view from the windows is really nice. We were well prepared with instructions and Jasmin that met us there when we arrived had some very good recommendations for Eureka. Overall we enjoyed our stay and were even amused by the tourists who were constantly taking photos of the building. Pink Lady was an elegant house but not in the way that makes you afraid to touch anything. We were all adults and did not fill up the house but we felt transported to a different time. Yet very modern, Jesse who met us was very informative and showed us the house. Very modern kitchen, washer and dryer, good view from some places. Highly recommend. Thank you so much for staying with us! It was so nice to meet you and have you as our guest. Thank you for choosing the Pink Lady during your visit to the Redwood Coast. We look forward to your return. Wonderful! 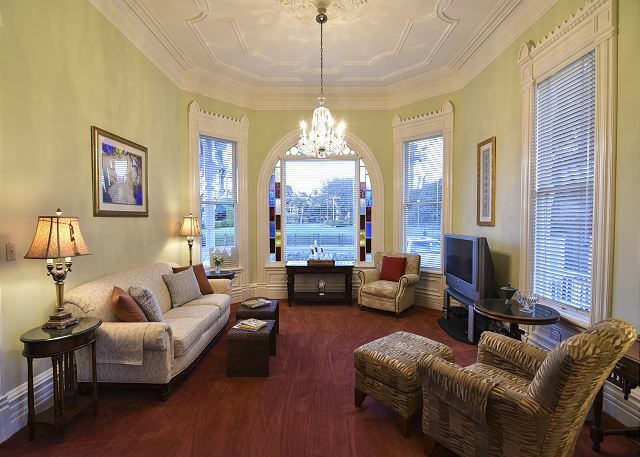 Beautiful house and accessible to Oldtown, Eureka. Great for a larger group. Right next to a Pokemon stop and Pokemon Gym! Thank you so much for coming to stay with at the Pink lady! we are so pleased too hear you enjoyed with amazing piece of history! Perfect spot for the family getaway! The Pink Lady was a great choice for what we wanted - close to all the water and forest activities in the area. It was centrally located from everything we wanted to do. The house itself was VERY clean, especially seeing how much needs to be cleaned. Clean and well appointed kitchen, very large dining room, plenty of space for the family to spread out and enjoy themselves when we weren't out exploring. That's saying a lot - we have 6 kids. Classic style with just the right touch of modern amenities. Wifi and cable were just enough. 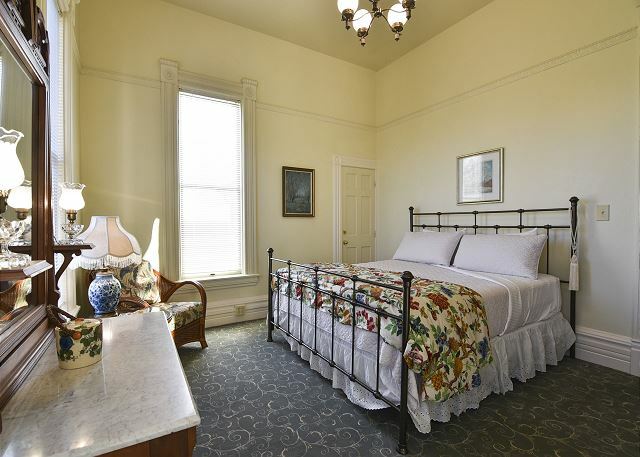 I would highly recommend this house to any family looking for a quiet stay with a little history to go with it. What a great experience to actually live in the Pink Lady for a weekend! Perfect for our group of 5 (mom & dad and three teenage kids). 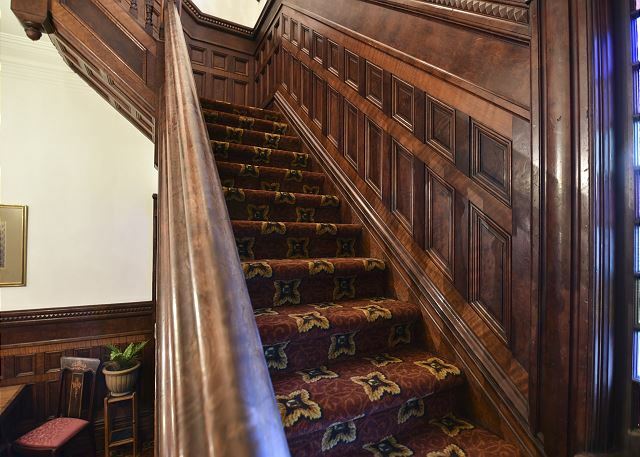 The private tour and dinner at the Carson Mansion was memorable. We had a great time and would absolutely do this again. My family of four just came back from Eureka and staying at the "Pink Lady", and I must say it was a once in a life time experience. It is a piece of history, the furnishings matched the time, the appliances and accessories were modern, great location and property management met us there for a quick tour and called to check in the day we left. For sure more cost effective than staying at a hotel. Highly recommend. 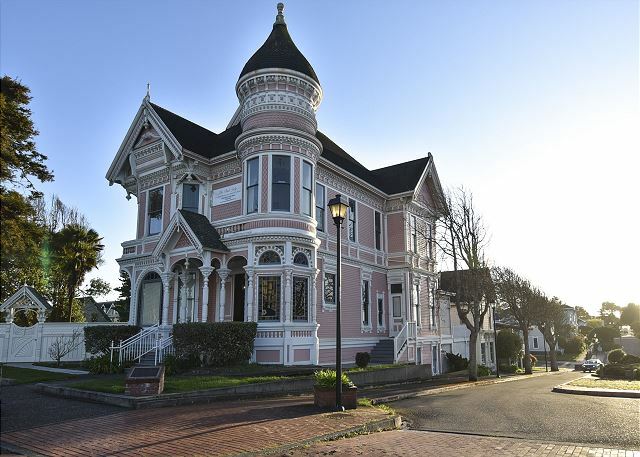 Wonderful Victorian in Eureka, CA! Jesse and the property management team were extremely proactive and responsive. Kitchen is modernized, though a little small working area (as are most Victorians). 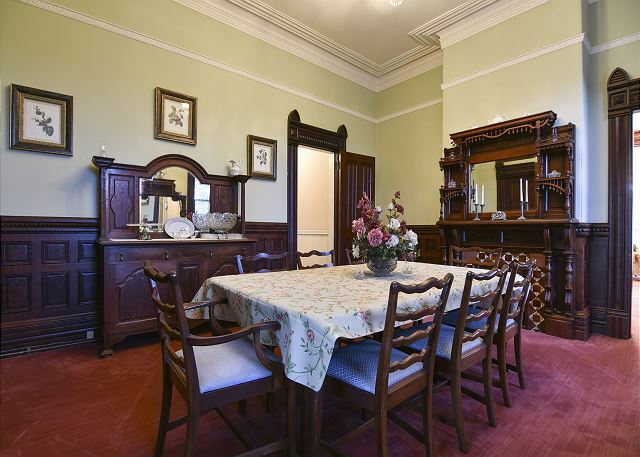 I recommend this house to anyone who appreciates 19th century architecture! Thank you Bryan, It was so nice meeting you and the family. The Pink lady is amazing, as you found.... We look forward to accommodating you in the future at the famous Pink Lady! !